The other thing that struck me funny was the idea of voters with this vague notion of Pete Hoekstra — sort of like, “it must be time to vote because there’s that Pete Hoekstra guy again and he seems to be running for something.” I could try to explain to you why I think that’s funny, but then it wouldn’t be funny. After that, I was just casting about for additional thoughts. 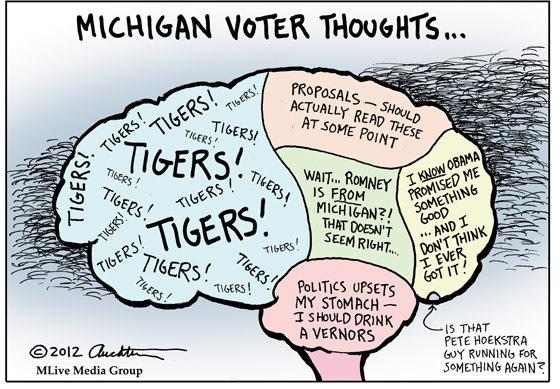 The obvious one last Thursday when I was drawing this was that Michiganders would be totally pre-occupied with the Tigers and the World Series. 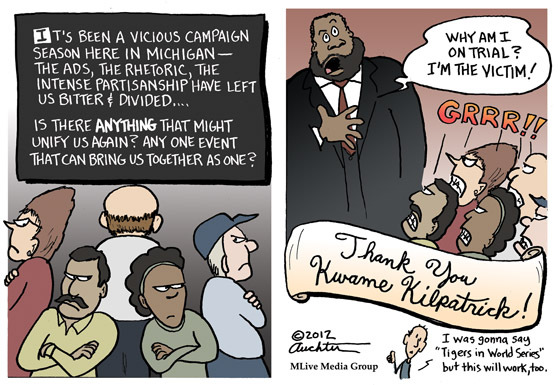 But by the time the cartoon hit the newspapers Sunday, the Tigers were swept. *Sigh* Maybe that’s why I don’t have any particular enthusiasm for the cartoon anymore. Summer is now totally over and we only have elections to look forward to…. 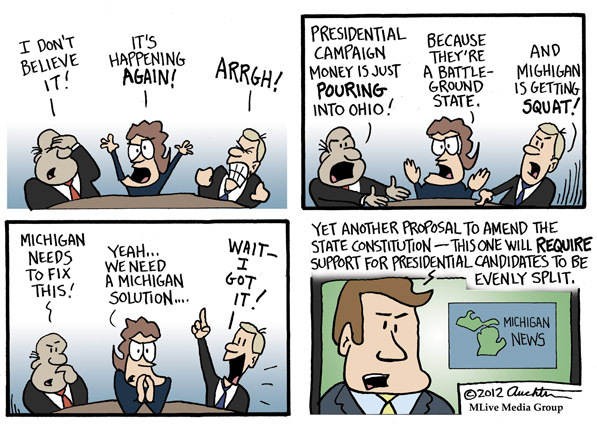 It’s Happening Again …and We Need a Michigan Solution! Four years ago, the McCain campaign pulled out of Michigan in October, ceding the state to Obama. Sara Palin rather famously and publically disagreed with the decision and wanted to fight on. The so-called mainstream media in Michigan never loved her more at that moment. But alas it was not to be. Without a designation as a battleground state, millions of media dollars were not spent here. Most were spent in Ohio. Fast-forward to 2012. Back in September pollsters figured Michigan to be leaning Obama and again those ad dollars never made it north of Toledo. 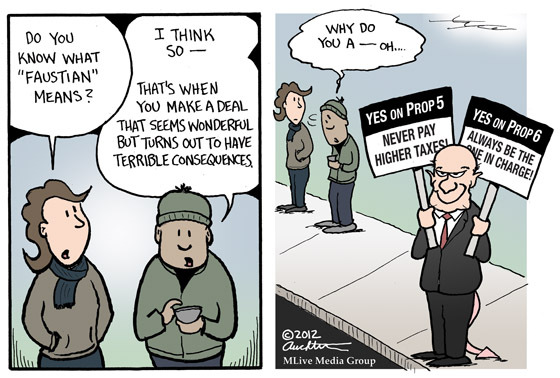 Luckily for our election economy, we have six ballot proposals of dubious merit for many special interest groups and one billionaire robber-baron to throw money at. And, boy, have they! So my idea with this week’s comic was simply to tie this together. Since apparently the end always justifies the means when it comes to amending our state constitution, why not guarantee ourselves a piece of the presidential campaign money? Not any more crazy than, say, Proposal 6. I was thinking about the tail in particular when I was drawing Ambassador Bridge owner Matty Moroun in the second panel. If you have been unfortunate enough to experience a “Vote Yes for Prop 5/Prop 6” ad (and if you lived in Michigan the past few months, you definitely have), you know the deals Moroun is spending millions to make with you. It’s sickening really to the point of comical (and then back to sickening again). I wanted to add something to let readers know that I think Moroun is playing the role of Mephistopheles here — trying to trick voters into very bad decisions. But I wanted to be subtle, and the tail seemed like a good solution. So take heed Michigan voters! Or in the coming weeks I may have to add the horns, pitchfork, and cape. ArtPrize, the world’s largest art competition, took place in Grand Rapids over the past few weeks. Winners were announced last Friday with over $560,000 in prize money awarded. This was the fourth year for ArtPrize, and it was amazingly successful. 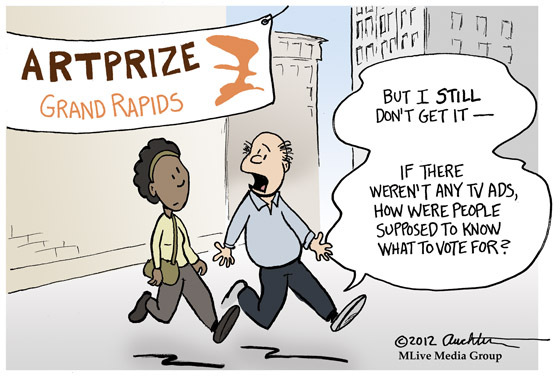 The big prizes are determined on a public vote — people come downtown and cast votes on what they like. No ads. No campaigning. Very democratic and — especially in an election year — kind of refreshing. I myself didn’t actually make it to ArtPrize this year. On the beautiful weekends when strolling the streets of downtown Grand Rapids was at its prime, I was laboring on my own sort of art project at home — putting a new roof on my shed. In the many moments when I was adapting my plans (and making yet another trip to the hardware store), I thought about how this thing would make, like, the worst ArtPrize entry ever. As with most large, publically viewable art installation, its purpose and worth is subject to opinion. It’s either a ghastly but marginally functional architectural solution or some sort of God-awful plastic/treated lumber prophylactic or an unwittingly efficient pre-made home for wasps, hornets, and other very angry buzzy things. Or all of these things. Don’t worry. I have no way of transporting it, so you are all safe to go to ArtPrize next year.